The issuing company appoints investment bankers to help them decide. Investment bankers do their research about how much a company can earn in the future and what kind of cash flow it can generate, and then arrive at a valuation that is comparable to that of similar companies in the industry. This valuation then decides the price. So, say, if ABC Ltd is offering shares in an IPO at ₹ 100 per share, then you know that this price takes into account how well the company can generate cash and profit in future. Surya Bhatia, certified financial planner and managing partner, Asset Managers, said, “The days of 30-40% gains on listing on IPOs are gone. 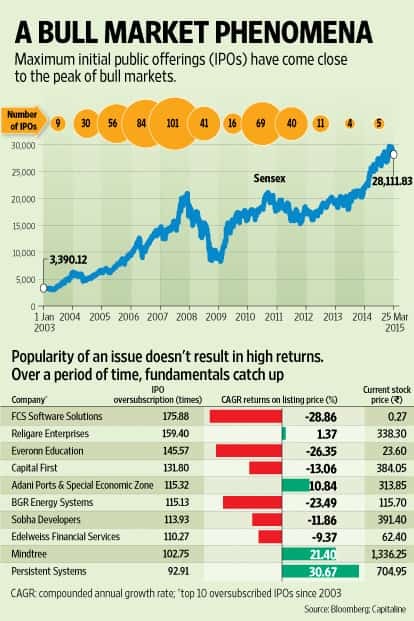 Investors have to be careful about valuations; an issue by a company with sound fundamentals but which comes at a high price may not be worth it." These days IPO pricing has become quite aggressive. Parag Parikh, chairman, PPFAS Asset Management Pvt. Ltd, said, “The novelty of IPOs is not there anymore; IPOs are now priced at market rates. The investment bankers want to get the maximum benefit for the company by pricing the issue at the highest possible point. This leaves nothing on the table for investors." “Companies don’t want to sell their shares in a bear market because they won’t be able to get a good price. But then where is the logic for investors to buy these shares in a bull market, when valuation is high?" said Parikh. “Valuation is the key to arriving at a decision to invest in an IPO. Investors need to look at aspects such as earnings multiple, compare with peers in the industry and see if that is indeed the best option available," said Vinay Agrawal, chief executive officer, Angel Broking Ltd. Besides, the more oversubscribed the issue, the lesser the allocation that you will get. Applying for shares worth ₹ 2 lakh and getting an allocation worth ₹ 50,000 or ₹ 1 lakh may not be worth it. Pointing out the need to consider qualitative aspects, Agrawal said, “It’s important to also consider how the company will use the IPO funds; will the additional funding help the company generate strong revenue going forward? Be careful in instances where the funds raised are primarily going to be used for objectives such as reducing debt."